with over 120 available slips. BLT has appointed Stamford based RHYS as its exclusive leasing agent for office leasing at Harbor Landing, led by Cory Gubner, President & CEO, and Christian Bangert, Executive VP and Partner. 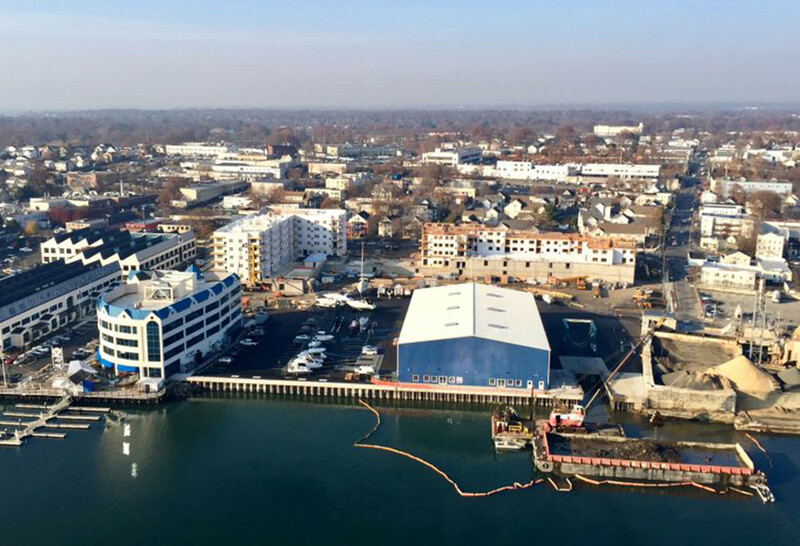 Harbor Landing is currently making significant improvements to the office space, formerly known as Stamford Landing, including a new entry to the property, upgrades to the lobby and common areas, new tenant amenities, improved landscaping and newly designed parking lot. “We are extremely excited to be working alongside BLT during this repositioning and are very optimistic that the capital improvements being made will bring tremendous interest from the office tenant market,” said Bangert. “We stand firmly behind BLT and their vision for the Harbor Landing complex, which provides one of the most unique office settings in all of Stamford, while offering tenants incredible value and competitive rental rates,” added Gubner. The Harbor Landing residential apartments and boatyard, formerly known as Davenport Landing, complete the transformation of this new live, work, play community. The Hinckley boatyard is open for business and is currently hauling vessels for winter storage. The apartments are nearly completed, and are expected to begin leasing in early 2018. The office space features flexible layouts that can be tailored to a wide variety of tenants, large and small, with spaces ranging from small suites up to 35,000 square feet of contiguous space. Existing amenities currently include on-site security, shuttle to the train, fitness center with yoga studio, marina slips, and two restaurants, Crab Shell and Prime, which are located within the office complex. These restaurants serve as an additional amenity where tenants and residents can enjoy lunch, dinner and happy hour. The wide and scenic boardwalk is just over a half mile walk connecting the Hinckley boatyard and Harbor Landing buildings to Boccuzzi Park, which is in the midst of a major renovation and beautification project. Harbor Landing offers a shuttle service that transports employees to the Stamford Transportation Center in just under five minutes, providing immediate access to Metro-North, Amtrak and all the dining options in Stamford’s Central Business District. During the summer months, a complimentary water taxi is available to access Harbor Point’s expansive offering of restaurants, shopping and events. Harbor Point is the transformative waterfront mixed-use development where over the past several years, BLT has built thousands of luxury apartments, a diverse retail and restaurant scene, outstanding and activated public spaces, and brand new modern office space.